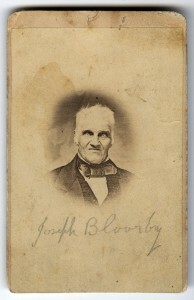 Portrait of Joseph Bloore, 1850. Unknown photographer. Nestled among the tall trees of Rosedale Valley lies the Necropolis Cemetery, home to the peaceful resting places of Jack Layton, William Lyon Mackenzie, and another headstone that also bears a familiar name, albeit with an additional “e.” Joseph Bloore, the namesake of the bustling street we know today as Bloor Street, helped to develop and modernize the young city of York. He created places for family and community to grow; and set a model for city-building that current developers should emulate. Born in 1779 in Staffordshire, England, he was a Methodist who immigrated in 1811 to Canada, where he quickly became a prominent figure in early Toronto. Bloore owned a hotel at 157 King St. E., known as the Farmers’ Arms Inn. Today the site of the hotel is home to the St. Lawrence Hall. 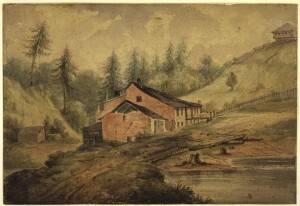 In 1830, Bloore sold the hotel and built a brewery in the Rosedale Valley. The building was made completely of red brick and was powered by water from nearby Severn’s Creek that Bloore damned for use with the brewery. The subsequent pond was popular among local families for ice-skating. 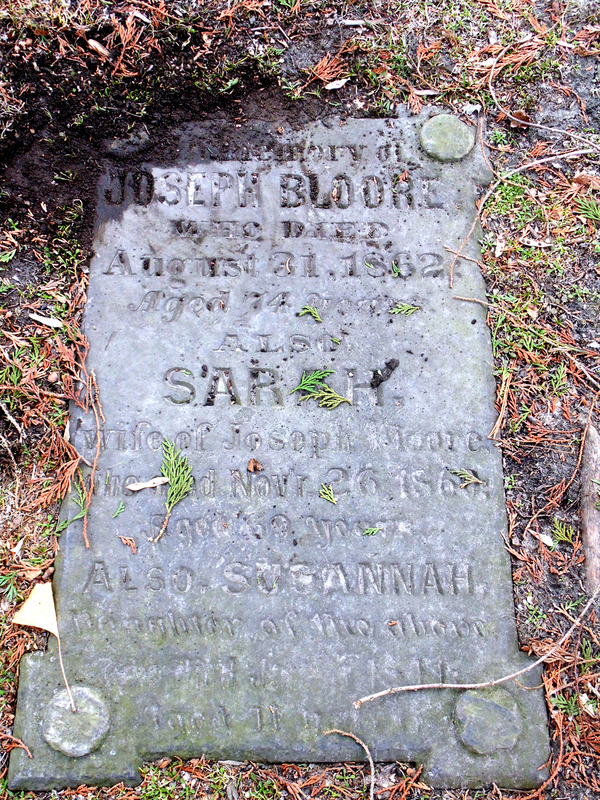 Bloore operated the brewery from 1830 to 1843 when it was bought by John Rose, a fellow brewer, and renamed the Castle Frank Brewery. Bloore’s Brewery operated from 1830 to 1843. It was located beneath what is now the Sherbourne Street bridge just north of what was then First Concession Road, now Bloor Street. Watercolour by Richard Baigent (1865). 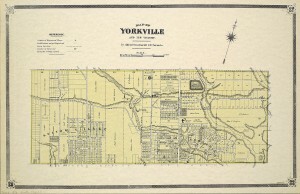 In the same year that he sold the hotel and built the brewery, Bloore founded Toronto’s first annexation and “commuter suburb” with Sheriff Jarvis: the Village of Yorkville. 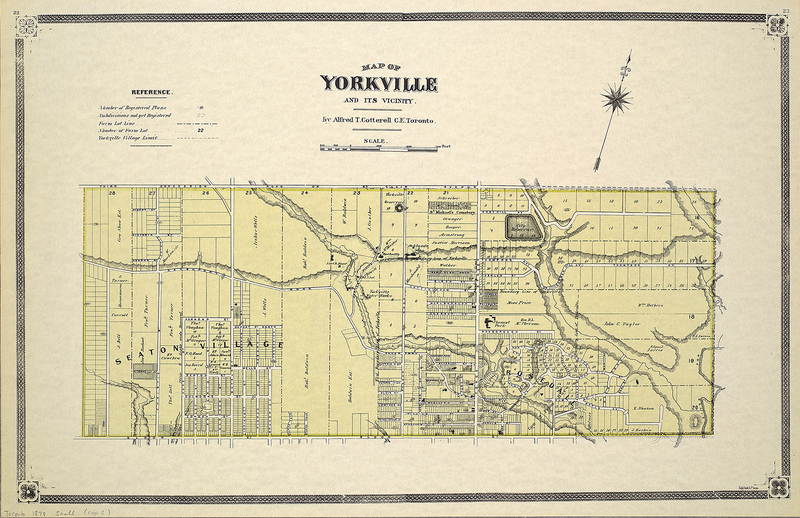 It was originally set to be named Bloorville, but Jarvis was opposed to this and so it became the name of the area now known for its high end shopping. The small community utilized its own waterworks, town hall, fire hall, and cemetery. That graveyard, located at the northwest corner of Yonge and Bloor streets, was known as York General Burying Ground, later Potter’s Field, and was Toronto’s first non-sectarian cemetery. There is no longer a field of course, but a plaque commemorating a field. The remains and the monuments moved to Mount Pleasant Cemetery and Necropolis Cemetery between 1851 and 1881. Upon his retirement, Bloore bought a considerable portion of land on the north side of First Concession Road Line. This road was renamed three times: first St. Paul’s Road, then Sydenham Street, and finally Bloor Street as we know it today. It is unknown when, or why, the “e” was removed. At the time, he donated some of the land he had bought to a local church group in the area. 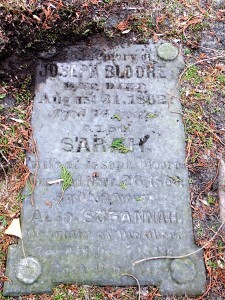 Joseph Bloore died on Aug. 31, 1862, at the age of 74. His physicality has been lost to the ages, although there exists an intimidating portrait of the man. In the photo, Bloore, his lips turned into a curmudgeonly sneer, stares out from huge white overexposed eyes with a piercing gaze. So, the next time you walk down Bloor Street, remember its namesake, his piercing gaze, and his contribution to our city. But please, add an “e”.